The Zeiss reputation as the “best” folder, probably got started with the 531A, 530, and the 532/16 series.. all of them “Super Ikontas”. If the prefix “Super” is used, it denotes a coupled rangefinder. Until the very late 1950’s, Zeiss’ rangefinder consisted of a stationary or folding arm which held two prisms which rotated as you focused … it also gives the Zeiss Super Ikonta C (and its Russian Mockva 2,3,4, & 5 copies) their distinctive appearance. In general it is tougher to find a really nice solid minty Zeiss Super Ikonta C than most Super Ikontas… same with the Russian copies. BUT, they are usually fitted with the Tessar lens and give excellent results! 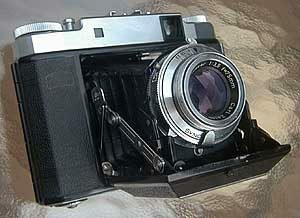 The “Brunhilde” as I call it, of the Zeiss line is the Super Ikonta B, the 532/16 & 533/16. 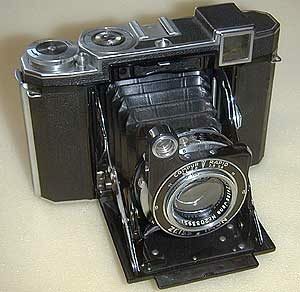 These as SOLID HEAVY cameras compared to most others, they are “tanks,” so to speak. Always fitted with a Tessar, at least I have not seen them with Novar lenses, and usually has a Compur-Rapid shutter (synched) and after 1953, Synchro-Compur shutters. The camera has full auto film wind. Excellent quality, but often show their age and heavy use. 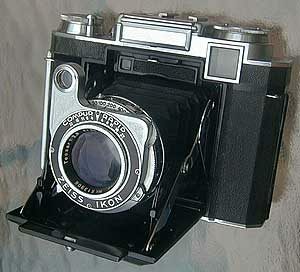 One very under-rated Zeiss folder I think is the so-called “Mess-Ikonta” 524/2 or 524/16. Basically it is an Ikonta B 523 with an uncoupled rangefinder added. The rangefinder is every bit as good as an Isolette III. Lenses for the Mess-Ikonta are often Novars, but they can be had with Tessars as well. Theses are usually found in very excellent condition. The high end, aside from the 532/16, of Zeiss’ folder offerings has to be their final run of folders, the Super Ikonta III and Super Ikonta IV. Both have coupled rangefinders of course, auto film double-exposure prevention (actually all Zeiss’ have that), auto frame counter, and in the case of the IV, also a light meter that is usually still good today!! Both of these cameras are relatively light, lighter than the Agfa Super Isolette, and offer superb and reliable performance. 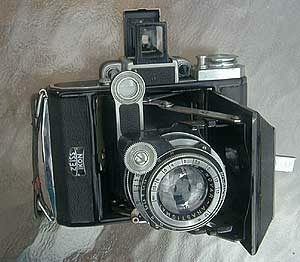 The III is fitted with either an f3.5/75mm Novar or Tessar. Shutters are most often Synchro-Compurs, but you can find one with a Prontor SV-S. The Super Ikonta IV is always fitted with a Synchro-Compur and Tessar lens. If there is one common shortcoming of the III & IV, it is that the film spacing is very narrow indeed. The only solution to the often slight overlapping of frames is a thorough cleaning of the advance gearing… and that improves things quite a bit, though you still can’t park your car between frames!! Over-all, a solid, handsome, quality built, and super performing lensed folder. Hey, it’s a Zeiss! !